This post, inspired by our recent backyard camping trip, is sponsored by Campfire® Marshmallows. All opinions are my own. Summer! Ok, I know I said last week that I felt like Summer is already over, but I am trying my hardest to slow our mental pace through the season. However, it’s hard to just sit back and relax when we are juggling all the excitement over move. A new house is a really big thing for us, as we’ve lived in our same house for over 10 years. We are creatures of habit and this big change is shaking us up something fierce. In addition to trying to get the most out of everyday of our precious summer, I’m trying my hardest to keep cooking when half of my kitchen is packed in boxes. I’ve put off packing everything because we still have a week before the movers come, and guys, I can get a lot of cooking done in one week. As far as the cooking gear I’ve left unpacked, I have left my trusty rimmed baking sheets, my mixer, my cast iron skillet and my non-stick frying pan. Plus a few spatulas and tongs. I’ve been very creative in figuring out what I can do with limited supplies and so far, so good. Last weekend, my nephews came over for a sleepover and we had big plans to camp out in the backyard, cook hot dogs and of course, make s’mores. Well, the rain had other plans and we had to abandon the actual sleeping-in-a-tent thing. Luckily, the rain held off for long enough to enjoy some hot dogs and a good old fashioned s’mores making session. Earlier in the day, I had made some meringue cookies (because they are so unbelievably simple, amazing and delicious plus I only needed my mixer and baking sheets to make them -yay) and thought they would make some pretty awesome s’mores! 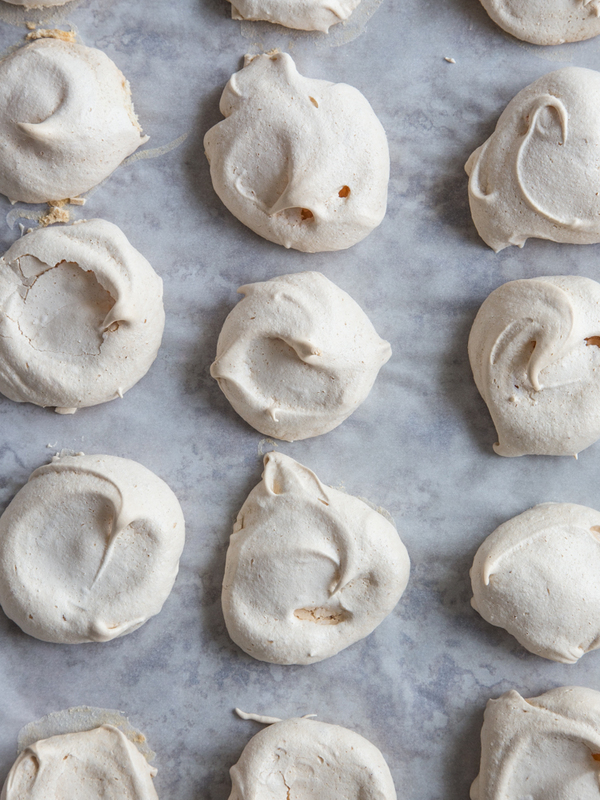 Have you made meringue cookies before? Light, airy and melt in your mouth fantastic. They’re basically egg whites whipped with sugar that you bake. Take a look at my newest video to see just how simple they are. Plus you can catch a little s’mores action with C at the end! 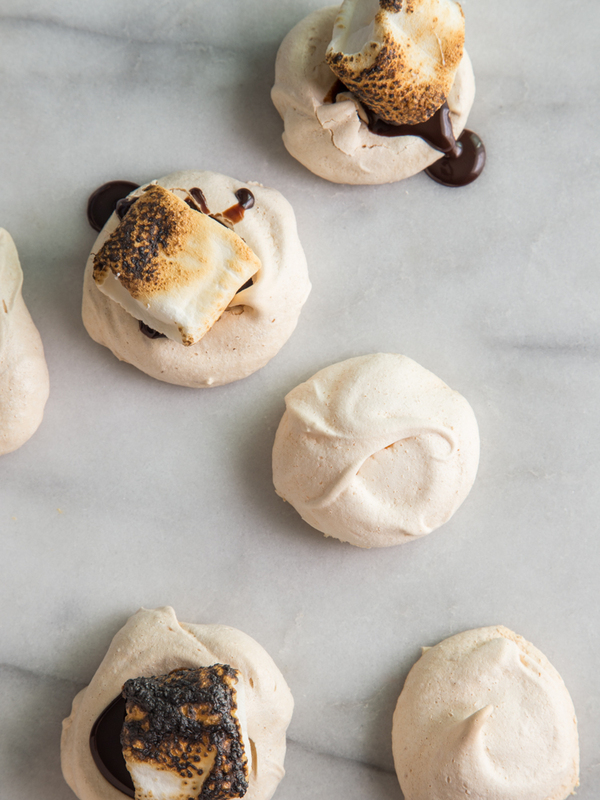 To turn these meringue cookies into meringue cookie s’mores, I used my favorite Campfire® Marshmallows. Always perfectly soft and fluffy, not to mention rich in flavor, these marshmallows continue to be my family’s all time favorite. For this back yard camping trip, there seemed to be some disagreement about whether to use regular or the Giant Roasters with the meringue cookies and we ended up breaking out a few of both so everyone was be happy. That’s what is so great about s’mores – they’re totally customizable! I layered my meringue cookies with a drizzle of rich chocolate sauce and a perfectly roasted marshmallow. My husband got ambitious and even layered a bit of chocolate bar and a traditional graham in between two regular marshmallows and the cookies. It was delicious, albeit, messy. When it comes to making s’mores everyone has their own ideas of what will make them perfect. 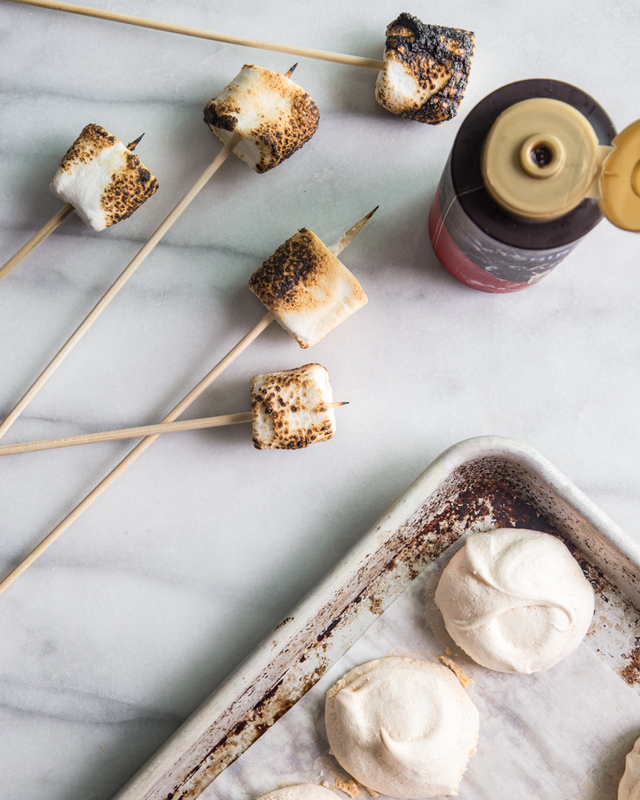 From ingredients to the level of marshmallow toast-i-ness, a s’more can be made to suit everyone’s taste. 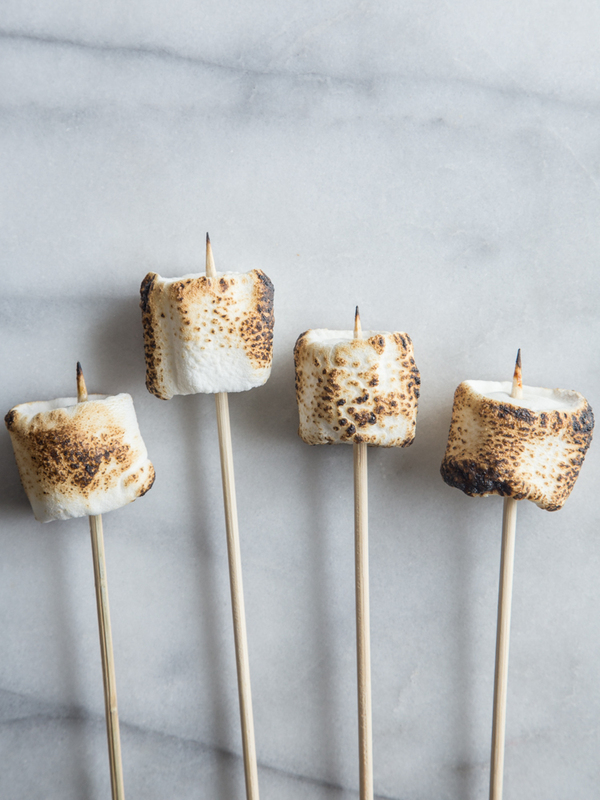 Speaking of having s’mores for everyone, Campfire® Marshmallows is hosting their annual S’more Recipe Contest! 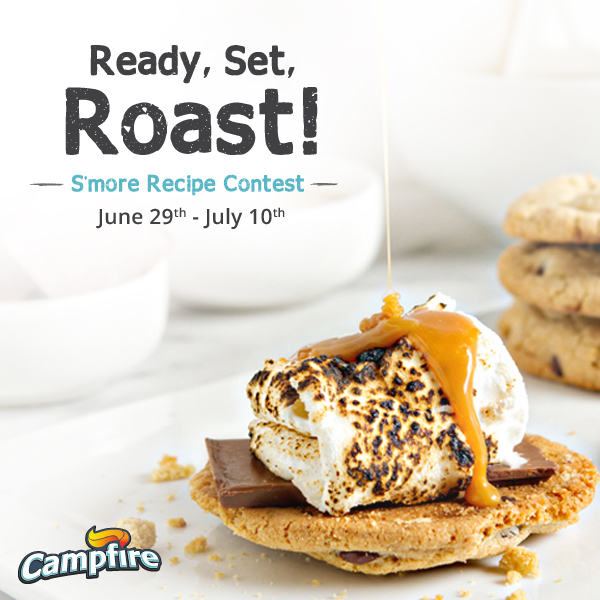 Campfire® is looking for your best S’more recipe! 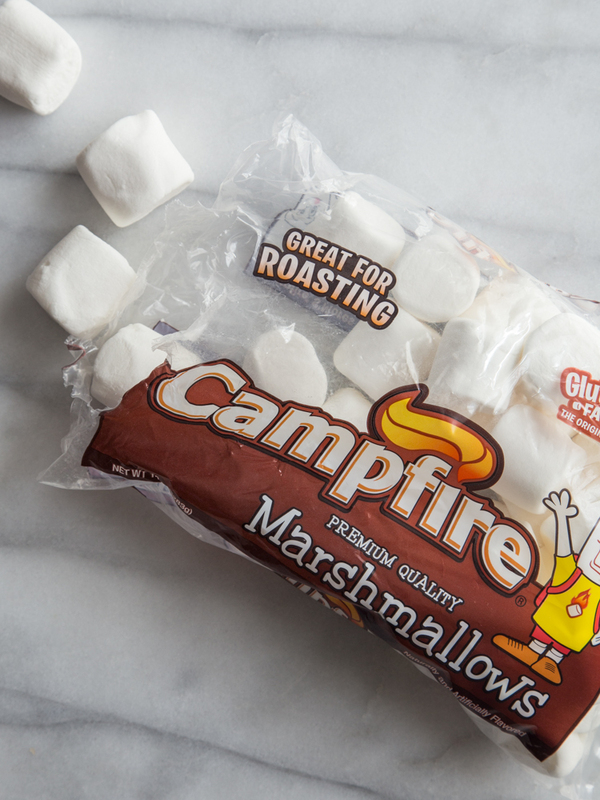 As long as it’s full of roasted and toasted Campfire® marshmallows, it’s something we’ve got to see! Check out Campfire® Marshmallows on Facebook and then submit an original recipe using Campfire® marshmallows from June 29th through July 10th for a chance to win a full patio set with fire table! This table is absolutely amazing, you need to check this thing out! For more details, official rules, and the recipe submission form, visit Campfire®’s brand new website. Preheat oven to 275 degrees. Line two baking sheets with parchment paper and set aside. In a very clean bowl of an electric mixer, beat egg whites and cream of tartar on low for several minutes or until slightly frothy. While mixer is on, add sugar slowly by the tablespoon. Increase mixer speed to high and beat egg whites until thick and glossy. Spoon egg white mixture into heaping tablespoon mounds and flatten the tops of the mounds with the back of a spoon. Bake for 60 minutes. Leaving the oven door closed, turn oven off and allow cookies to sit in the oven for an additional 60 minutes. Cookies should appear dry when finished. Allow cookies to cool in a dry place. Place one meringue cookie on a plate and top with chocolate sauce or square of chocolate bar. 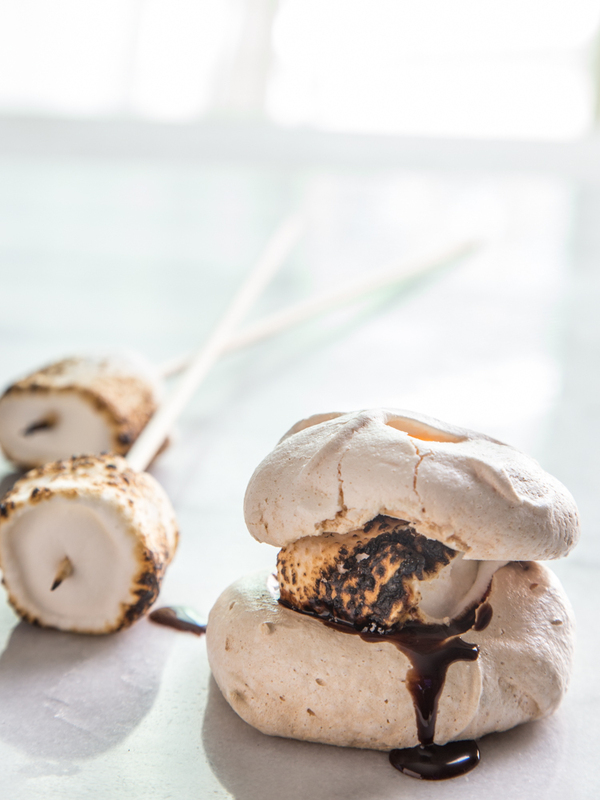 Top chocolate with roasted marshmallow and place a second meringue cookie on top. Enjoy! Meringue cookies will remain crisp for about 1 day if kept in a cool, dry place and stored in an airtight container. If cookies become soft, they are still delicious! I can’t get over how delicious these look. This is such a great twist on the classic s’more. Great video! Girl I think you are a GENIUS! Pinned. Thanks so much, Paula!! I hope you’re having a great summer! How gorgeous is this! Such a cool idea! I will definitely have to make these this summer.